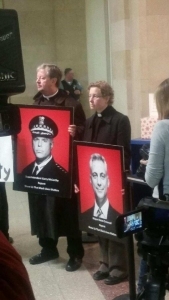 A large group of community and religious leaders took over the fifth floor lobby of City Hall Tuesday, March 24th holding signs that read “end the brutality” and “police accountability now,” outside of Mayor Rahm Emanuel’s office to talk alleged police mistreatment, including allegations of abuse at the Chicago Police Department’s Homan Square facility. “We have been asking the mayor for over four months to just meet with us and listen to this issue, listen to the people, but he has chosen to ignore our communities,” said a member of the Chicago Renewal Society, a faith-based organization that works to eradicate race and class barriers. “He has ignored the police brutality that’s happening every single day. He’s ignored every single person in this room. 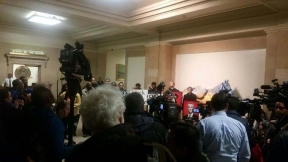 So today we demand action.” While some protestors took to the microphone to send a message to the mayor, others staged a die-in to demonstrate the victims they say have been beaten by Chicago police officers. Throughout the protest police officers made sure to keep the peace, however at least three arrests were made for disobeying police orders. They were soon released on account of the activists’ right to assemble. “The Chicago Police Department will always protect residents’ right to free speech and peaceful assembly. As you have seen over the past several years, protests have all been peaceful, and CPD goes to great lengths to ensure protesters’ First Amendment rights, even shutting down major streets in some cases for demonstrations,” the CPD said in a statement.